Lilmoth is one of the eight-major cities in the province of Black Marsh, serving as the most centralized settlement in the region of Murkmire. Lilmoth is colloquially known as the "Festering Jewel of Black Marsh." Lilmoth is a merchant city known for the sunken Imperial villas that were built during the Second Empire's hold over the region. Unlike other cities, Lilmoth has no centralized government, it is instead ruled by a council of powerful merchants. Lilmoth is built on the southern point of the region of Murkmire, in the wetlands that make up the southern coast and the river estuary that leads into the Oliis Bay. Just outside of Lilmoth's northern gate is the rainforests that lead into the rest of the region, towards Bright-Throat Village and eventually, the Keel-Sakka River. The land features minor settlements built by those native or working around Lilmoth. Such as the Hereguard Plantation, one of the few Bretons settlements outside of Lilmoth, it produces rice. Then there is the infamous Blackrose Prison, which is found further north towards the Dead-Water Village. Blackrose Prison is an Imperial fortress, surrounded by other abandoned Imperial settlements. Speaking of ruins, there are some rather notable ones, such as the Xinchei-Konu Monument, which was built in time of Argonian civilization known as pre-Duskfall. It is an ancient calendar that showed the Argonian's view of time. Another ancient ruin is the Ixtaxh Xanmeer, whose full name is the Ixtaxh-Thitithil-Meht, which was naturally changed to be spoken easier. Lilmoth is neighbored by several settlements, including Alten Meirhall in the northwest, and Rockpark in the northeast. Lilmoth is a walled-off settlement. Surrounded by traditional Imperial walls facing the rest of Murkmire, and the water, while Argonian walls are found in the city's backside, towards the Oliis Estuary and more Imperial ruins. The water in Lilmoth is fairly shallow, large ships are unable to dock inside of Lilmoth, and are instead docked outside into the sea, but close enough to move goods. 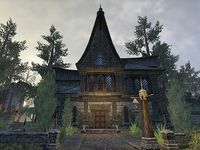 Despite the outer Imperial appearance, Murkmire-Argonian architecture consists of ninety percent of Lilmoth's architecture. This style of building is made for the marshes of Murkmire. They are supported by wooden stilts, which sometimes extends far into the air, so much that it overlooks the city. These high platforms would connect with each other, slowly ascend from the ground, hovering above the water and the marsh. Imperial homes built on that soil had already sunken into the swamp. Towards the wall is a couple of Imperial buildings, such as the base of the Cyrodilic Collections. There are several distinct parts of Lilmoth. There is Pusbottom, which is considered one of the dodgiest places in Lilmoth, but it is also known as the ancient, gangrenous heart of Lilmoth. As of now, Lilmoth's criminal underground operates out of Pusbottom. There is Old Imperial Lilmoth, the ancient ruins of the Imperial Lilmoth. It is filled with old-encrusted villas festooned with vines, large bamboo, and sleeping palms. Shines, a harmless cousin of the Will-o-the-Wisp are known to loam around the ruins. In Lilmoth, there is a Hist Tree, as well as, a sunken shrine of Xhon-Mehl, the Ancestral Organ Lord of Lilmoth. Lilmoth's foundation was not rooted in the native Argonians. It was, however, built by the Lilmothiit, a nomadic race of vulpine Beastfolk that live across southern-coastal Black Marsh. The name, Lilmothiit, in fact, may translate into "one who is from Lilmoth" in Ta'agra. The Lilmothiit are nomadic, so whether they consistently live in Lilmoth is unknown. The race would eventually go extinct in 2E 560 with the arrival of the Knahaten Flu. However, at one point before this, Lilmoth had become an Argonian settlement, ruled by a Priest-King/Queen. During the Blackwater War in 1E 2833, the Imperial General, Lucinia Falco had begun a third campaign against Argonia, known as the "Falco Doctrine." Falco had temporarily recruited the pirates of the southeastern seas, and in the combined effort with the Diamond Marines, the Imperial Legion was able to conquer the cities of Lilmoth and Archon. The Blackwater War ended in 1E 2837 when the Argonians surrendered to the Imperial forces of the Second Empire. With the Imperial acquisition, came renovations to Black Marsh that would make it more imperialized. Lilmoth would later participate in the Four-Score War, during the reign of Reman Cyrodiil III. Warchief Ulaqth of Lilmoth was present at the Battle of Bodrum, commanding the right flank against the Dark Elves of Morrowind. The Second Empire was defeated at the hands of Vivec at Bodrum. 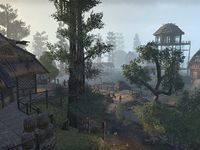 By the mid-Second Era around 2E 583, the Imperial villas built from the Imperial occupation had fallen into disrepair, claimed by the environment, and replaced by the typical Murkmire architecture. At this point in time, Lilmoth had become a bustling trade city with no centralized ruler, it was, however, ruled by a council of highly-influential merchants that operated in Lilmoth. They tended to port tariffs, and employ guards to patrol Lilmoth's streets. Murkmire, in general, has a less-structured justice system. Local tree-minders and warchiefs would often deal with affairs in their own territory, whereas in Lilmoth, people would often look for council through their elders, such as the retired Shadowscale, Sulahkeesh. Since its founding in 2E 572, the region of Murkmire, and by extension Lilmoth, were a part of the Ebonheart Pact, one of the three alliances that fought in the Three Banners War. However, tales of the conflict were only spread through sailors, as the warfront is miles away from Lilmoth. And so because of this, there was little support and interest coming from Murkmire. Regardless, recruiters were present in Lilmoth, seeking extra arms. in their cause. In 2E 583, the Cyrodilic Collections had established their base in Lilmoth, seeking to uncover the ancient history of Argonia before Duskfall. Eventually, the group had uncovered the mystery of the Root-Whisper Tribe and the Remnant of Argon. Umbriel comes from Clavicus Vile's Realm (The Fields of Regret). In 3E 80, the Warlady of Lilmoth was named Ioa. As far as the early 2nd century of the Third Era, the city-state of Lilmoth had been ruled by a Priest-King/Queen. But that changed around 3E 109, when Prince Magnus Septim had married Queen Hellena of Lilmoth, who had executed the previous Argonian Priest-King. Queen Hellena had the Imperial interests in Black Marsh admirably. Following their marriage, Prince Magnus Septim had become the King of Lilmoth. The Imperials had dwelled in Pusbottom since the Empire had established themselves in Black Marsh, but had since moved away from what had become a slum in Lilmoth. As of 3E 119, during the reign of Emperor Antiochus Septim, King Magnus, and his siblings, Cephorus I and Potema had held prosperous reigns throughout their kingdoms, holding good relations with other kingdoms and the greater Empire. In 3E 120, the War of the Red Diamond had begun, with the Kingdom of Lilmoth at the forefront along with the Empire, against Queen Potema's Army. In 3E 125, the Argonian Army had moved across Morrowind and into Skyrim to face against Potema's army at their home. In the same year, Queen Hellena had given birth to Pelagius Septim III. In 3E 127, King Magnus faced Potema's forces at the Battle of Falconstar but had lost and retreated. Years later in 3E 137, King Magnus, alongside with Emperor Cephorus I had defeated Potema in a siege at Solitude. In 3E 140, King Magnus I was named the Emperor of Tamriel. Around 3E 173, the Hist Tree of Lilmoth was purged by the other Hist Trees in Black Marsh after it was going rogue. The current tree grows from the roots of the old one that was killed. The roots are spread all the way into lower Lilmoth. During the Imperial Simulacrum in the late Third Era, the city-state of Lilmoth was an active settlement, being ruled by Queen Artomeda. It had a rivalry with Archon and Blackrose. After the Oblivion Crisis in 3E 433, the An-Xileel had risen into prominence across Black Marsh. 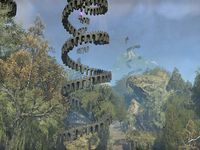 The An-Xileel in Lilmoth are the only ones who were able to take with the Hist Tree in Lilmoth, while the An-Xileel and wild Argonians were the ones able to even see it. The Synod had no conclave in Lilmoth, nor anything at all for roughly 400 miles. At around 4E 40, the floating city of Umbriel had invaded Tamriel, and the first victim was the city of Lilmoth. The Hist had controlled the An-Xileel and used them in its march across Tamriel. Mind-controlled An-Xileel, and undead creatures destroyed Lukiul Argonians, and foreign races respectively. The "Slaughter at Lilmoth" ended with the destruction of the city, as Umbriel's march expands and head towards Morrowind and the Imperial City. For game-specific information, see the Arena and ESO articles. This page was last modified on 30 January 2019, at 18:16.